Bradley Andrews brings us the Kent Ultimate perspective on T2 and the C Tour. After the excitement of Tour 1, the second C tour of the season at Tour 2 in Nottingham presented an opportunity to be victorious against old and new rivals alike. Teams had to step up their game just to hold their seeding, let alone potentially move up the rankings and even make B tour: every team brought intensity and determination, making C tour as competitive as ever. All players, both experienced and new to the game, from C tour up to A tour, were finding the weather conditions difficult to play in. There was a strong wind on the first day as well as torrential rain (and some hail). It meant that most set plays that teams had practiced became difficult to run, as discs were harder to grip and muddy fields made cutting much more difficult. This was Ultimate at its most gruelling. 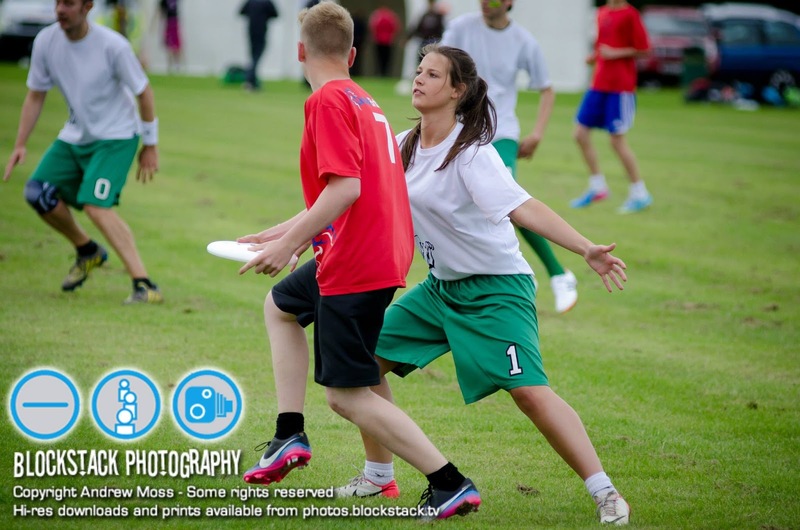 The future of UK ultimate battling in C tour – Devon 3 vs GB U17s. Photo Courtesy of Andrew Moss. Conditions limited the play, especially on ‘up wind, down wind’ pitches. Everyone was using similar plays, using the wind to send a huck to a deep cut and taking advantage of the space underneath when defending teams sent extra men to prevent the deep shot. 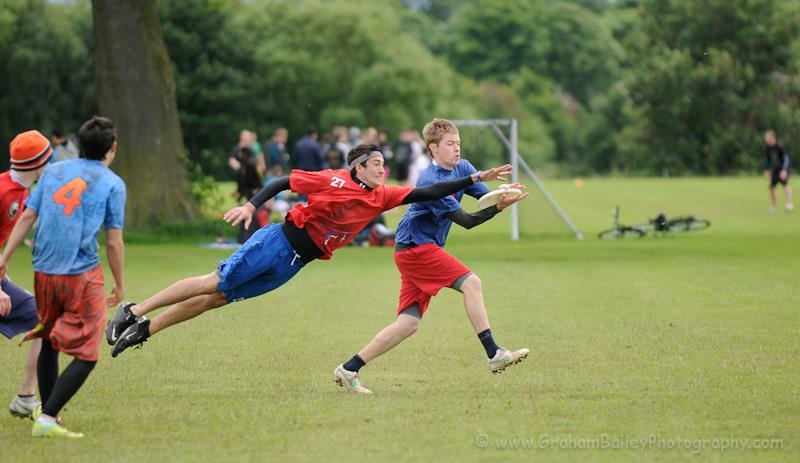 This ‘huck and d’ strategy was common practice for many teams as scoring an upwind point was extremely difficult in the conditions. There was a lot of zone defence on show, using the wind to limit opponents and force them to complete a lot of passes. Due to conditions Tour 2 was a real test of throwing and catching ability, as well as how well teams co-operated and worked together to score points and keep their zone defence working effectively. 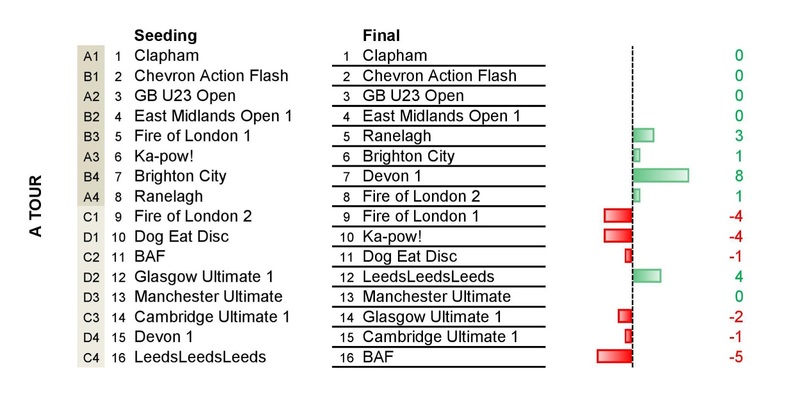 While Saints, Ireland U20 and Flyght Club 1 all progressed to B tour, all of the teams in C tour played competitive Ultimate to a good level, showing the increase in the quality of Ultimate in recent times. Sneeekys and Curve also finished high in C tour, capitalising on the weaknesses of other teams and playing hard defence as well as well co-ordinated offense. 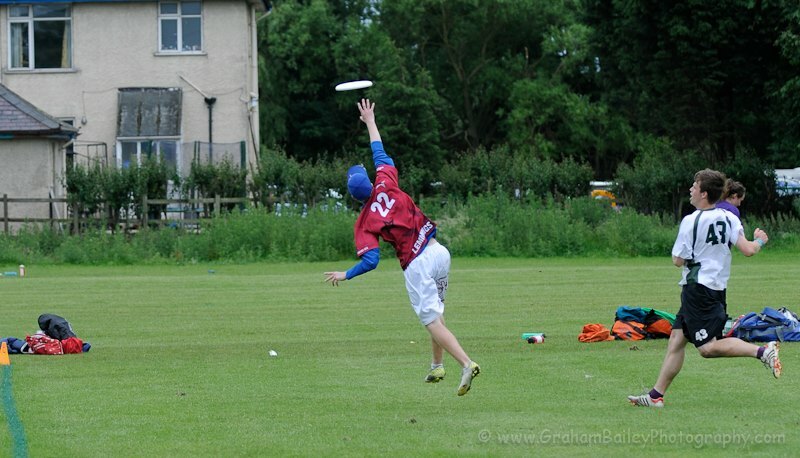 Lemmings player going for the high grab in Nottingham. Photo courtesy of Graham Bailey. All teams in C tour played with their hearts on their sleeves, enduring the miserable weather and playing conditions. Brighton Pier Pressure, for example, started the weekend with only eight players and were down to six players by midday Sunday but never gave in to the fatigue and weather, showing their determination to win no matter what. 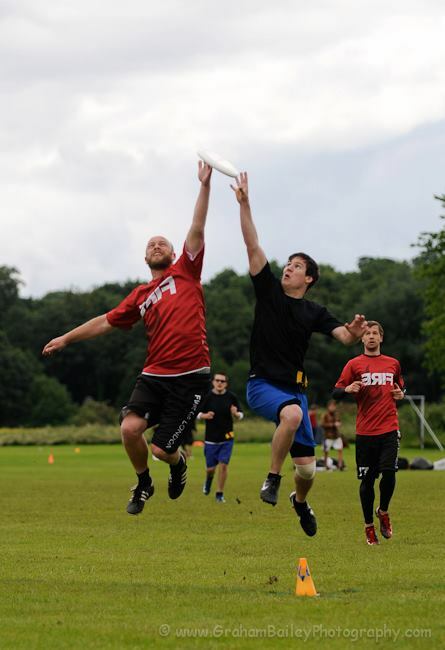 During the game they played against Kent Ultimate they lost yet another player to injury but showed their class and continued to play when many teams in their position would be all too happy to throw in the towel. On Sunday the time cap was changed from an hour and a half to an hour, meaning that the point cap was also changed, with teams taking the half at seven points rather than eight. The shorter format changed the games dramatically as many teams were finishing matches and reaching tie breaks before the half. Shorter games also made an upwind score a larger asset as teams would have less time to take back the upwind point than on the first day. C Tour movers. Courtesy of Wayne Retter. Though the weather was almost unbearable and everyone was soaked the weekend ended in good spirits. The atmosphere of the Ultimate community could not be dampened by the rain, with friends and rivals coming together to create an unforgettable weekend. Almost there and only 3 days until #ukut3!! First things first; comment, like and share. DP @ tSG.